1. Wash and cut the vegetables. Keep aside. 2. Wash the quinoa and rice 2 times and soak for 30 minutes in 3 cups water. 3. Heat oil in a pressure cooker, add cloves, cinnamon, peppercorns, cardamom, black cardamom, aniseed, black cumin and bay leaf. Fry them. 4. Add green chillies fry, add chopped onions fry, add minced ginger and garlic fry. 5. Add mint and some cilantro fry. Add cut vegetables and salt. Cook for few minutes. Add green peas and cook for 2 minutes. 6. Add soaked quinoa, rice and the water in which it is soaked. Add yogurt, mix well. Add balck cardamom and clove powder, add biryani pulav masala mix well. 7. Add lemon juice, remaining cilantro and salt. Cook for few minutes in low to medium heat then cover the lid and cook in medium heat till 1 or 2 whistle. 8. 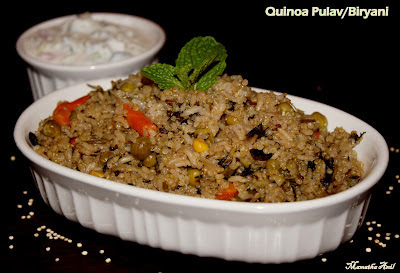 Quinoa pulav is ready to serve. Serve with Raita.